In January 2019, the land between the front of the Museum buildings and Kew Bridge Road finally came into the ownership of the Museum. While it had always been part of the pumping station’s land, it was held by Barclay St James (who developed the flats next door to us) and not by the Museum. The land had been planted with a lawn and high evergreen “Spanish Laurel” hedges, effectively screening the Museum from the sight of passers-by. We know from old photos that the front of the pumping station was well cared for historically and the people took pride in the appearance of the site. A lawn and decorative flower border ran across the entire frontage, the border roughly following the route of the present railway line. This was a significant operation, requiring hundreds of annual plants to be grown each season and probably replanted twice a year! All the plants were grown from seed and several greenhouses were erected near the filter beds for that purpose. With the land now in our possession, our Collections and Estates Manager, Ed, had the vision of returning the front garden to its original format, thus helping us meet our listed status obligations and making us more visible from the road. This would involve removing the hedges, recreating the original flower borders, reinstating the gravel driveway (which originally led from the gatehouse to the front doorsteps) and replacing large quantities of landscaping gravel with a new lawn. Ed invited my wife Linda – a keen gardener – to design and cost a planting scheme. The Board of Trustees gave the go-ahead, volunteers were drafted in and work began in February this year. So far, approximately 200 hedging trees have been laboriously dug out and the wood reused in the upper garden. A new flower border 40m long by 1 metre wide has been dug and the soil boosted with 3 cubic metres of “soil improver” (aka composted horse poo) and 20kg of fertiliser. The pile of cinders from the engine has been levelled to become a contrasting hard surface (a good use for our waste product!) and large quantities of gravel have been raked off the surface and temporarily stored for future use. The bed between the wisteria and the front door has also been cleared. The first perennials have been planted, some as bare roots which are not yet visible but are there! The remaining plants will go in later in the spring once they are ready for transplanting. Linda got busy with the plants through 2018, buying job-lots of perennial plug plants in the spring sales, growing them in our greenhouse and then caring for them through last summer and winter in our allotment. She also divided some of the congested perennials in our own garden. Given the heat last summer, that meant a lot of watering! In total, over 300 perennial plants have been supplied and we are also re-using many of the original plants from under the cherry trees in the Museum front garden. So far 94 bergenia have been transplanted into the long border – some of these currently look wilted (who expected hot weather in March! ), but they are very tough plants and the majority should survive. The total cost to the Museum of plants has been less than £100, while at retail they would have cost upwards of £3000. There is still plenty to do, particularly removing the gravel embedded in the soil of the lawn area which is an essential job before the lawn is re-seeded. If you would like to help, please email museum@waterandsteam.org.uk. 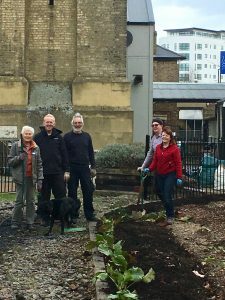 Some of our brilliant garden volunteers!